A global healthcare company has announced the creation of nearly 500 new jobs in Dungloe, County Donegal. Randox Teoranta currently employs around 66 people at an engineering and life sciences centre in the town. That figure will rise to 540 after a €25m euros (£20m) investment over the next six years. 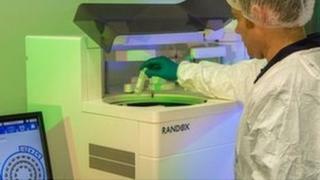 The company is developing new tests to diagnose common diseases like Alzheimer's, chronic kidney disease and cancer. Founder and managing director of Randox Laboratories, Dr Peter FitzGerald, said the Dungloe base was central to the company's future. "Our strategy for Randox Dungloe 2020 is a strong demonstration of our commitment to the region, and indicates our commitment to Randox Teoranta as an integral part of our future plans. "This is a visionary project with the power to transform the high-value knowledge economy of the region and we are excited by its potential. "We are planning to create cutting-edge scientific and engineering opportunities on a major scale, that would mean drawing talent from far and wide in order to drive innovation in human health." Dr FitzGerald said the announcement would have no impact on the group's Northern Ireland operations at its headquarters in County Antrim. The company said it would be keen to recruit from a pool of people who may have moved away for education or employment, as well as those with a broader connection to the region. Gaeltacht Minister Joe McHugh said it was significant news for the region. "This is a significant announcement by Randox today, a company that is a world leader in clinical diagnostics, stating that its vision is to establish Randox Teo in Dungloe as a centre of excellence and develop the facility as one of the most futuristic and diagnostic manufacturing centres in the world. "This announcement illustrates the company's huge commitment to the area and its workforce." he said.